A nerve injury can render even the softest touch painful. This hypersensitivity, known as tactile allodynia, stems in part from the actions of stomatin-like protein-3 (STOML3), a protein that’s nestled in the membrane of nerve endings and that regulates the Piezo family of mechanosensitive ion channels. Now, using a newly identified small molecule that inhibits STOML3, researchers led by Gary Lewin, Max Delbrück Center for Molecular Medicine, Berlin, Germany, have shown that they can reverse tactile allodynia, at least in mice. Lewin and colleagues trawled through a library of 35,000 small molecules, screening for those that prevented STOML3 from self-associating. Ultimately, two did so, dubbed oligomerization blockers 1 and 2 (OB-1 and OB-2). 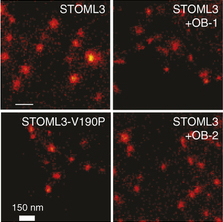 These not only decreased the clustering of STOML3 in the plasma membrane, but also silenced a subset of mechanoreceptors in the animals. Miriam Goodman, Stanford University, US, who was not involved in the study, said that the STOML3 inhibitors could help extend research on touch sensation. “Molecules like OB-1 and OB-2 provide us a tool that can be used in other studies—for example, in other animals where we might not have such easy access to genetic tools to manipulate what’s happening in the skin,” she said. The researchers also found that OB-1 relieved allodynia in two models of nerve damage. “These molecules seem to be effective in interrupting touch hypersensitivity, and that is something that we don’t really have any other tools for,” Goodman added. The findings were published online December 12 in Nature Neuroscience. Currently, drugs used to treat allodynia, such as gabapentin, only work for a small proportion of patients, said Lewin. Worse yet, they often cause a host of side effects. “Gabapentin was originally developed as an anticonvulsant medication, not as a pain drug,” Lewin explained. In 2007, he and his colleagues identified what looked like a new target for painkillers. In contrast to normal mice, those genetically missing STOML3 appeared protected from developing touch-evoked pain after nerve injury (Wetzel et al., 2007). “At that point, there was the idea of, ‘How can we capitalize on that?’” said Kate Poole, University of New South Wales, Sydney, Australia, one of the first authors of the current study. An answer did not come until years later when Poole, working in Lewin’s lab, showed that mutating a single amino acid in STOML3 prevented its oligomerization, and at the same time, disrupted its ability to tune Piezo ion channels (see PRF related news story; Poole et al., 2014). “We then had a way to come back and target STOML3,” she said, hypothesizing that by inhibiting STOML3 from self-associating, they might be able to block pain. In the new study, Poole, along with co-first author Christiane Wetzel and colleagues, developed a high-throughput screen for chemical inhibitors. They first fused the N- and C-terminal halves of yellow fluorescent protein (YFP) to separate STOML3 molecules; when these fragments unite, they emit a fluorescent signal. Then, they tested whether each compound from a library of thousands reduced this fluorescence in human embryonic kidney cells, which would indicate that STOML3 oligomerization had been blocked. Remarkably, only two seemed to fit the bill—OB-1 and OB-2. And, of relevance to future drug development, OB-1 inhibited oligomerization of the human variant of STOML3. Next, the researchers visualized the size of STOML3 clusters in the plasma membrane of neuroblastoma cells. Compared to an inert solution, both OB-1 and OB-2 shrank these clusters. In support of the idea that these molecules directly act on STOML3 rather than changing its expression, levels of STOML3 messenger RNA (mRNA) remained unchanged. STOML3 regulates touch through its interaction with Piezo1 and Piezo2 (see related PRF stories here and here). To assess how OB-1 and OB-2 affected these ion channels, the researchers deflected the membrane of neuroblastoma cells while recording Piezo1 currents. Relative to an inert solution, both molecules reduced the amplitude of the currents, suggesting that they tamp down the sensitivity of Piezo proteins. Consistent with these findings, additional results showed that three hours after OB-1 was injected into the hind paws of male and female mice, more than 40 percent of recorded Aβ fibers in a skin-nerve preparation did not respond to mechanical stimulation. That’s in contrast to the less than 7 percent from control mice that were unresponsive. OB-1 appeared, then, to silence a large swath of mechanoreceptors. These effects of OB-1 on mechanoreceptors, in turn, raised the animals’ threshold for perceiving touch. In a task where mice were thirsty but could press a sensor to obtain water shortly after a mechanical stimulus was applied to one of their paws, receiving OB-1 reduced the likelihood that they would press it, relative to when they received an inert solution. Finally, the investigators tested if OB-1 could reverse allodynia following various forms of nerve damage. When given an inert solution, male and female mice with unilateral chronic constriction injury (CCI) to the sciatic nerve became hypersensitive to touch. Yet when OB-1 was directly injected into the paw between six and 21 days after they were injured, this behavior was reversed. In a separate cohort of mice, OB-1 also relieved the hypersensitivity seen in the steptozotocin (STZ) model of painful diabetic neuropathy. And yet no such effect was seen in the spared nerve injury (SNI) model. They found that in the CCI, but not the SNI model, expression of STOML3 mRNA in the dorsal root ganglia of the injured side was twice that of the uninjured side. Consistently, they also extracted more STOML3 protein on the injured side of CCI mice. “When you just do a very clean cut of the nerve as in the SNI model, it seems you don’t end up having this downstream effect of increasing STOML3 levels,” said Poole. Without that increase, OB-1 is unable to counteract pain. While the study speaks to how OB-1 and OB-2 function, “there’s not enough information about the properties of the molecules themselves to know if they would make good drugs,” said Goodman. For example, “OB-1 was administered directly into the animal’s paw, not systemically, so we don’t know anything about toxicity yet,” she added. Wetzel C, Pifferi S, Picci C, Gök C, Hoffmann D, Bali KK, Lampe A, Lapatsina L, Fleischer R, Smith E S J, Bégay V, Moroni M, Estebanez L, Kühnemund J, Walcher J, Specker E, Neuenschwander M, von Kries J P, Haucke V, Kuner R, et al. Nat Neurosci. 2017 Feb; 20(2):209-218.